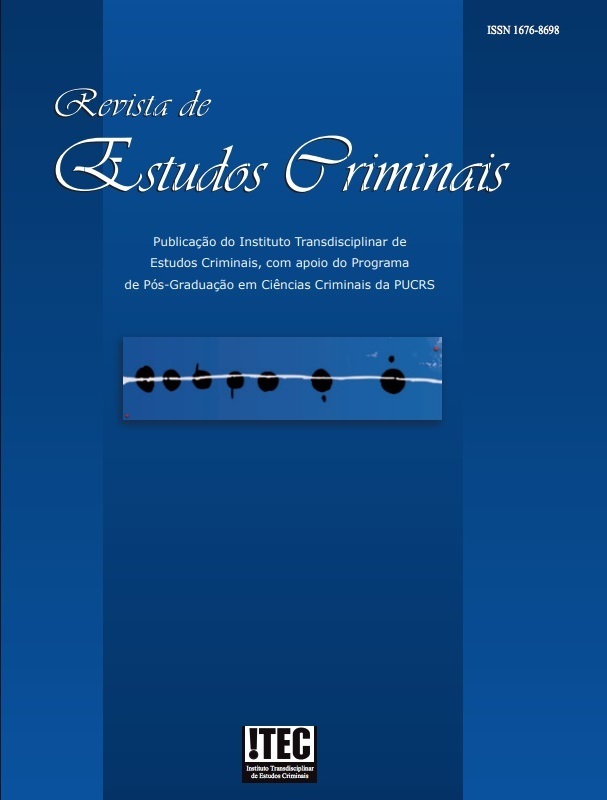 Revista de Estudos Criminais is the result of joint efforts to create a journal truly committed to the development of criminal sciences, by means of having a space for dialogue guided by the excellence of national and foreign contributions. Idealized in 1998 by the former students of the Criminal Sciences Graduate Program of PUCRS that, at that time, founded the Criminal Studies Transdisciplinary Institute (ITEC), Revista de Estudos Criminais became known in 2001. The journal has been published ever since. Moreover, it was officially supported by the Criminal Science Graduate Program of PUCRS and it is today a partner of Editora Síntese. The work of making the journal, however, keeps on profiting from the academic solidarity spirit, through the Graduate Program teachers' and researchers' voluntary work, as well as from the same ideals that lit up its creation. The result is a journal that has already a long journey, full of invaluable contributions coming from all over the country and reputed research centers around the world. It is, therefore, a journal that intends to benefit the development of science in Brazil and that is committed to its permanent improvement. Latindex is an information system on scientific, technical, professional, scientific and cultural research journals, published in the countries of Latin America, the Caribbean, Spain and Portugal. Summaries of Brazilian Journals is a Database of scientific journals managed by the Foundation for Scientific Research of Ribeirão Preto - Brazil. Directory of Open Access Policies of the Brazilian Scientific Journals. Brazilian Institute of Information in Science and Technology - Ministry of Science and Technology - Brazil.